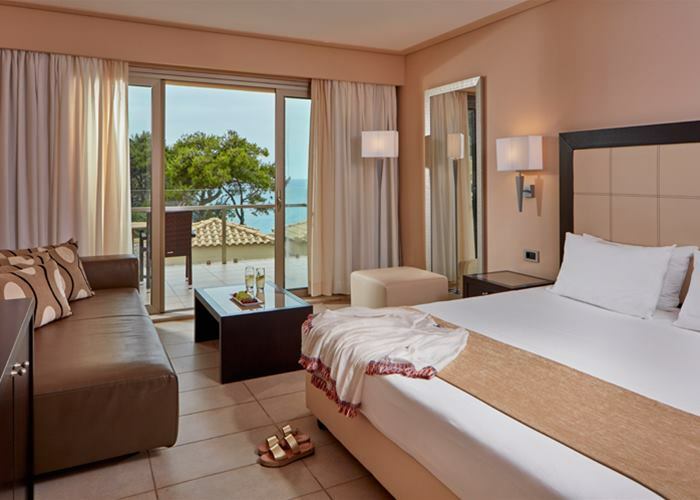 This beautifully luxurious hotel has breath taking panoramic views over the Ionian Sea creating the perfect destination that will be remembered for a lifetime. Adult orientated, the hotel offers a truly luxurious retreat in a unique way that draws guests back year after year. 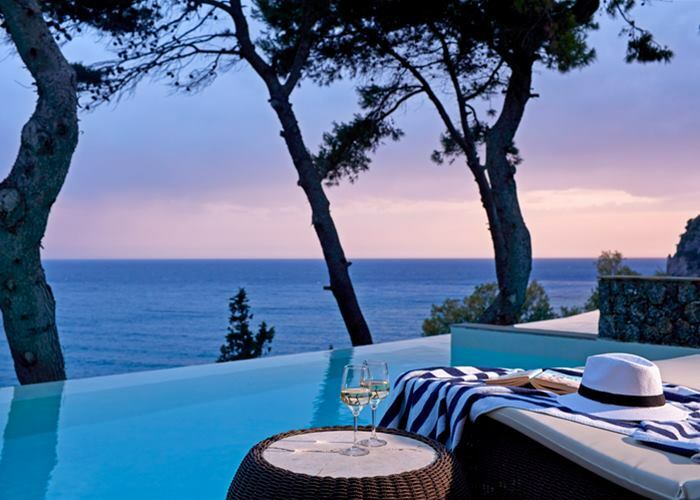 The resort spreads along 110 acres of cypress trees, eucalyptus trees and wine woods and cascades along breath taking cliffs, offering spectacular views. 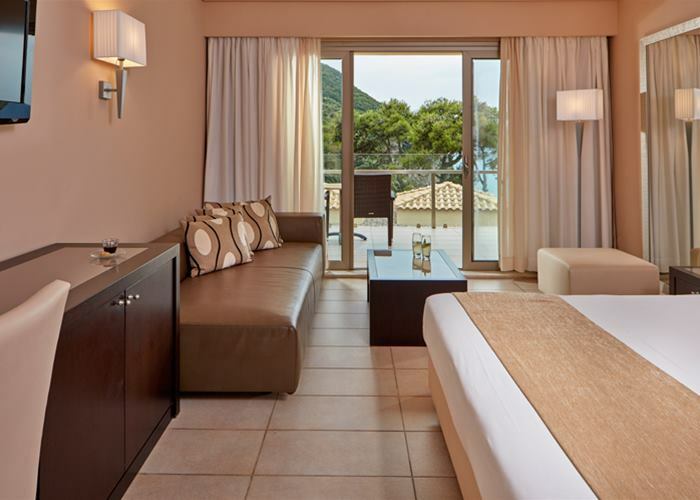 The resort’s location avails some of the best diving in Corfu, while its SensSpa offers a journey into serenity. The hotel is ideal for couples above the age of 16 years old. This suite heads up our collection with a stylish yet elegant decor. Space has not been questioned in these large suites that easily sleep up to 3. The master bedroom has a marital bed with a bathroom complete with a bath tub and a shower. The large living room easily doubles up in to a second sleeping space with the large and comfortable sofa bed. The room is complete with walk-in dressing room, mini fridge, free internet, LCD TV, air conditioning and is available to book with sea view or limited sea view. If you are looking for a luxury holiday with that something extra then your own swimming pool does not get much better. These elegant deluxe rooms can accommodate up to 3 people and are well designed for maximum comfort with a marital bed and sofa. The room is complete with mini fridge, free internet, LCD TV, air conditioning and is available to book with sea view. Double rooms sleep up to 3 people and offer more than ample space with clean cut décor and a fresh sophisticated feel. These elegant rooms are well designed for maximum comfort with twin or double bed as well as a comfortable sofa. 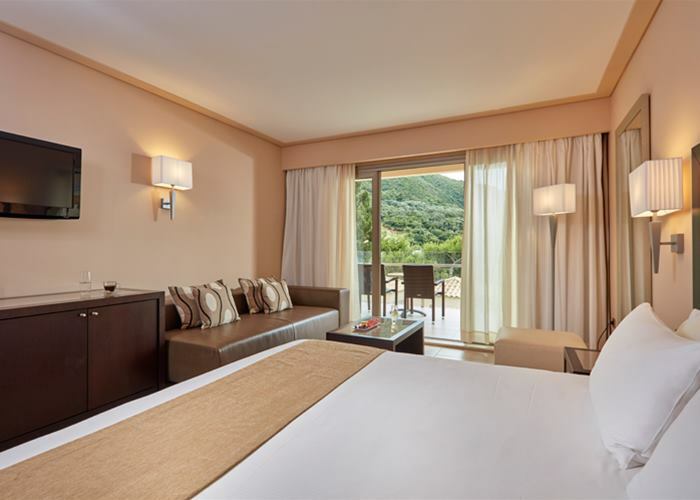 This mountain view room includes all the holiday essentials such as mini fridge, free internet, LCD Satellite TV and air conditioning. Superior Room showcase luxury and include all the necessities to make the perfect holiday, as well as offering breathtaking mountain views. There is a bedroom and a sitting area that is separated by a sliding partition and sleeps up to 3 people. Rooms come complete with mini fridge, free internet, LCD Satellite TV and air conditioning. Double rooms sleep up to 3 people and offer more than ample space with clean cut décor and a fresh sophisticated feel. These elegant rooms are well designed for maximum comfort with twin or double bed as well as a comfortable sofa. This limited sea view room includes all the holiday essentials such as mini fridge, free internet, LCD Satellite TV and air conditioning. Double rooms sleep up to 3 people and offer more than ample space with clean cut décor and a fresh sophisticated feel. These elegant rooms are well designed for maximum comfort with twin or double bed as well as a comfortable sofa. This room includes all the holiday essentials such as mini fridge, free internet, LCD Satellite TV and air conditioning. 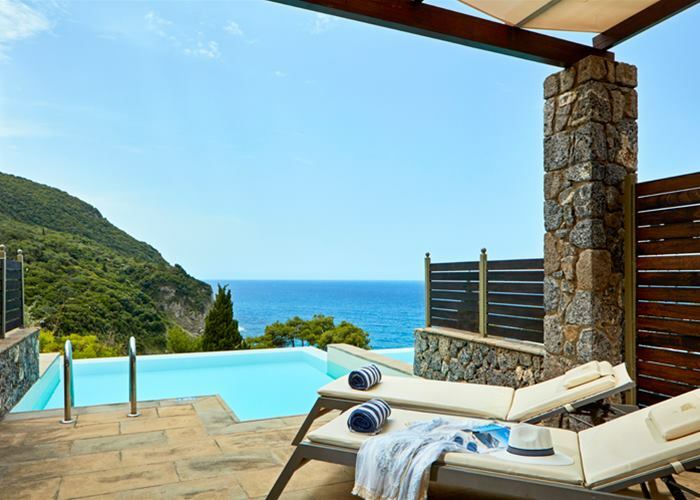 Indulge yourself to one of our Villas with own pool and you can surely relax in, with astonishing sea views you’ll never want to leave your luxury accommodation. Space has not been questioned in these large villas that easily sleep up to 4. 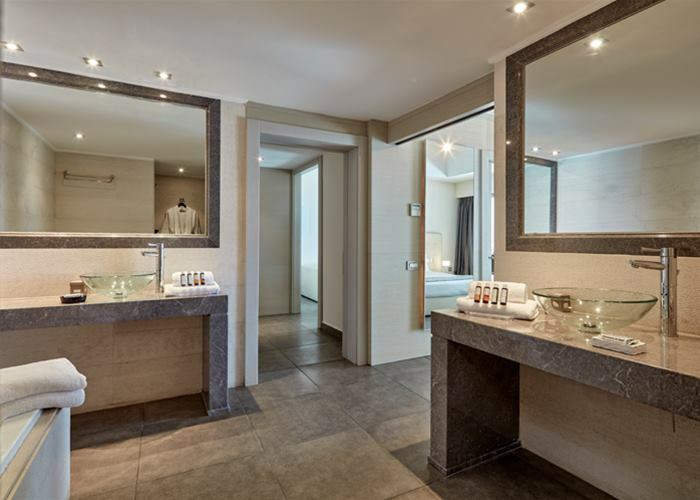 The master bedroom has a martial bed with its own bathroom with shower, whereas the second bedroom consists of twin beds and a bathroom with bathtub. The large living area has a dining area as well a comfortable sofa area for nights of relaxation. The room is complete with mini fridge, free internet, 42” LCD TV, air conditioning and boasts unforgettable sea view.